We had barely returned from our trip to Jamaica, when we decided to make a trip to Trinidad. This time it would be myself and Bugs alone, since hubby had to get back to work. We were having a family event, and now Bugs would finally get to meet the rest of his fam on his Mommy's side. Now I was a bit worried about travelling with a super active toddler by myself, but guess what, it went pretty well. He once again slept through almost the whole flight, much to the relief of the other passengers. Triniland was fun; I hadn't been home in over 2 years, and seeing all of my extended fam and dear friends was great. Of course the next best part of going home is the food lol. Roti, doubles, corn soup, callaloo, bake and shark, pelau, Royal Castle chicken and chips, and the list of deliciousness goes on and on. 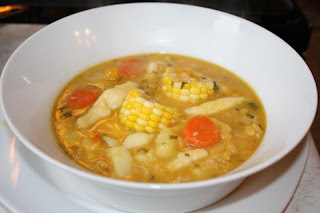 When I got back to SoFL I immediately decided to make a pot of corn soup, and I used the recipe from Caribbeanpot.com, a site that's quickly becoming one of my favorites. The soup came out perfect, so feel free to try this recipe on your own as well.